I’ve been feeling anxious about the many things I’m juggling at the moment, so I just did a “brain-dump,” hashing out my immediate deadlines and less imminent ones, projects where I owe work to others and projects where I owe work to myself, and when in the coming months I will be able to do that. This is something I do from time to time, but having just finished auditing the ArtistTrust EDGE program, I have a few more tips and resources under my belt, with healthy reminders about making time for the writing and valuing that work. I feel a lot better. Of my own projects, there are a handful of short stories that I want to develop further, a handful to submit (or continue submitting), and a general plan to arrange the collection (in hard copy, not in my mind, which I’ve pretty much done) in September. Anxiety-reduction aside, the brain dump also got me excited about looking ahead to my second novel. I wrote a quick, rough sketch of about 115 pages last April and put it aside to simmer. I took a number of inspiring and invigorating classes at Hugo House in March, including Chris Abani‘s class on voice and Sam Lipsyte‘s class on keeping a story going. Now, I’m taking Peter Mountford‘s excellent class on narrative structure, and had a really productive workshop of my synopsis and first chapter. I’m looking forward to digging deeper into the main conflict of the story before I set out to rewrite with more intention. And I’m excited to keep reading novels that I think will feed this book. For my first novel, I read countless books. I wish I had kept a more careful list all in one place, but my notes are scattered over many notebooks, and it would take me some time to sift through the pages to put it all together. I pretty much read anything I could get my hands on that was from or about Argentina and seemed remotely related, as well as a number of books that used magic realism in some way similar to how I tend to write it. I’m trying to be more organized about my second novel. So far, here are some of the works feeding into Novel # 2. If you have any recommendations that fit into the nodes developing here, feel free to leave a comment! 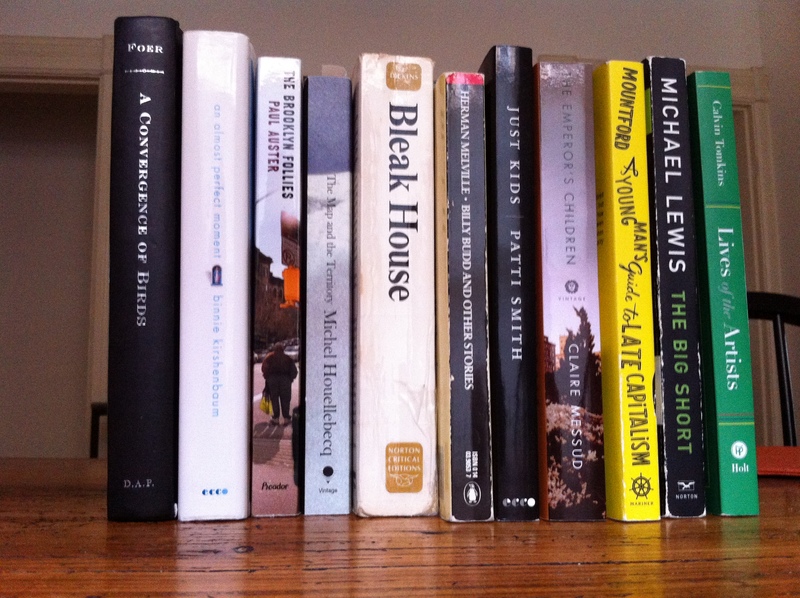 Pictured left to right: A Convergence of Birds, An Almost Perfect Moment, The Brooklyn Follies, The Map and the Territory, Bleak House, Billy Budd and Other Stories, Just Kids, The Emperor’s Children, A Young Man’s Guide to Late Capitalism, The Big Short, Lives of the Artists. Not pictured: some legal fiction by Grisham, some spy fiction by Le Carre.